Here are a few Free Baseball Drills which will help solidify your defense, and Offense, which will allow your team to play at maximum competition levels, while possessing limited power hitting or overpowering pitching. Anyone who has been around baseball any length of time has witnessed a base hit turn into a double, or maybe even a triple, while runners cross the plate and the defensive players look stunned and glued to the ground. While in Rookie ball, I had a coach tell me “Jim, the only spectators in baseball are in the stands.” What he meant was every player on the baseball field has a specific job and location he’s suppose to be at on Every play. Not just the ones the player is directly involved in, but all plays, because you never know when fate will suddenly have you directly involved in the play. An Off-Line or Overthrow, a dumb running mistake by the opposition or any number of things can happen in an instant which changes the direction of the play. Baseball is a complicated game, players are not born with the integral knowledge of how to play the game anymore than they’re born knowing how to play chess. They must be taught, and that’s the job of the Coach. Unless your playing at the Pro-Level, and sometimes not even then, Practice Time is always a limited and precious commodity which can not be wasted. Therefore, when designing and executing drills, the ability to include as many players, in as many training skills as possible, while maintaining a practice with an Upbeat momentum, is critical and highly desired. Maximum use of a limited resource … Time. It’s with these goals in mind, the following drills were designed. Intent: For the most part any action in the infield, even an easy 1 hopper to the shortstop, but hit by an Exceptionally Fast Runner is played at Full Fast Speed, and your Infielders must be able to react accordingly. Place your Infielders at their assigned position they normally play, have a catcher, with the exception of the mask, in Full gear (Learn to Love the Equipment) stationed at home plate. Begin hitting medium speed ground balls, but quickly accelerate to Hard Hit grounders, to the 3rd baseman, shortstop, 2nd baseman, who throws to the first baseman for the out, then quickly retreats back to their base to receive a return throw from the first baseman, which they apply as a swipe tag to the base, then throws home to complete the cycle. Slow Example: Ball hit to third, fielder throws to 1st, retreats to third to receive return throw from first, places swipe tag, throws home. ***Hit grounders to the first baseman and have him throw to second, third and home plate as if forcing a base runner out. Summary: This drill is intended to simulate an infielder fielding a ball, throwing for an out, then returning for a tag out of a runner attempting to advance. The player practices Fielding, Throwing, Quick Feet back to the base and Applying a Swipe Tag, all at maximum speed. Half way through the allotted time of the drill, change the drill sequence up. The intent of this change is to have the infielders practice charging and fielding balls to throw to home plate, the catcher practices throwing to every base, and the infielder applying a tag. Hit ground balls to each of the infielders, mixing the speed and locations, forcing them to quickly adapt their fielding and throwing position in order to throw to home plate for a force out. As the infielder’s throw approaches the catcher, yell which base you want him to throw to after catching the ball, mixing the bases up. This allows the catcher to practice receiving a throw from the infielder, which may or may not be on target, while keeping his foot on the plate for the force out, then quickly throwing to a base in an attempt to throw a runner out. … have the infield play at full, half or drawn in depth to simulate a real life scenario. … the fielders quickly slap a swipe tag or hold a tag in front of base for the runner to slide into as if a real life scenario. Quickness, Maximum Skill Practice, Maximum Player Involvement. Time management. This Drill is Not for beginners. Some plays in baseball may appear quite simple, but in reality are quite complicated in design and timing, and can have disastrous results if not performed correctly. The Defensive execution of the Run-Down is one such play which immediately comes to mind, but what is NOT often considered is the Offensive execution of the Run-Down. When Whitey Herzog, Hall of Fame Manager, coached the St. Louis Cardinals to World Series Championships, the media referred to the type of baseball the Cardinals played as “Whitey Ball,” or “Small Ball,” which referred to their certain style of producing runs. One such method was using the Run-Down & Stealing, Delayed & Straight, to push runs across the plate which would have normally been stranded on base. Here are a few Classic Run-down maneuvers to practice in order to create runs. This Drill is complicated, therefore you’ll need to walk your team through the individual actions once, or perhaps several times, until they totally understand their responsibilities. Players who understand the Who, Why, What of the drill will respond better and learn quicker, retaining the information. The intent or goal of this maneuver is to allow a run to score while the defense attempts to put out the runner caught in a Run-down. The runner must delay his put out until after the runner crosses home plate in order to count, if 2 outs. Players required: Entire Infield, Right Fielder, 1 runner at 2nd base & 1 runner at home. 1. The Coach hits a ground ball or line drive through the right side of the infield…. 2. The Right Fielder fields the ball and throws to the plate …. 3. The Runner on Second Base attempts to score. The Runner from Home Plate, simulating the batter, attempts to advance to second base on the throw…. 4. The Cutoff man (1st baseman) catches the incoming ball, throwing to second base to get the runner out attempting to advance to second….. Lets Stop Here and review exactly what situation we have and everybody’s positioning. 1. 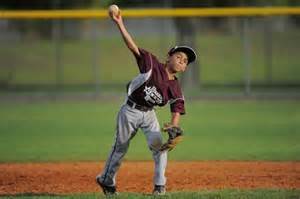 The 2nd baseman is in short right field to act as a relay man should the ball get passed the Right Fielder…. 2. The Shortstop is covering Second Base…. 4. The Catcher is covering home plate, facing Right Field anticipating a throw home…. 5. The Pitcher is 20’ to 30’ behind the catcher, facing the direction of the throw, backing him up. 5. The relay thrown ball, from the 1st baseman, beats the runner going to 2nd base, but instead of sliding into a tag, or simply giving himself up as an out, he retreats to first base forcing a Run-Down situation between 1st & 2nd base. In the event there is 2 outs, the runner between 1st & 2nd must stay in the rundown until the runner scores, before being tagged out or else the run won’t count. Exact scenario as above Except … the Fielders, instead of keeping the runner caught between 1st & second in a Run-Down, throws Home, which places the runner between 3rd & Home Plate in a Run-Down. The runner trapped between 3rd & home must stay in the Run-Down as long as possible, allowing the runner between 1st & 2nd to continue to run to third base. Although the intent was to score a run in exchange for an out, you at least now have a runner on third, who can score in numerous additional ways than if at 2nd base. The delayed steal is a thing of beauty when it works correctly, rather ugly when it fails. Intent / Goal: There may be a Two Fold intent for this play. 1. Advance a slower runner from 1st base to 2nd base, using the threat of the runner on third scoring in the event there’s a throw to second base. 2. Using the Delayed Steal to score a run from 3rd. Situation: Regular scenario, 1 out, runners on 1st & 3rd, slower runner on first base. 1. Have your pitcher deliver a pitch to the plate…. 2. The runner on 1st base does Not retreat from his secondary lead, but rather either stops or slowly continues to inch his way to second base…. 4. As the Catcher begins his return throw to the Pitcher, the Runner on First base takes off for Second Base…. 5. The Runner on 3rd, knowing the play is called, holds his lead, ready to advance home or retreat to 3rd depending on what the catcher does with the ball…. 7. If the catcher feints or does not throw, the slower runner steals second base. It’s imperative the runner on 3rd does not get faked off third base and put out. 8. At this point the drill can be run in several different ways depending on the coach’s desires. B. 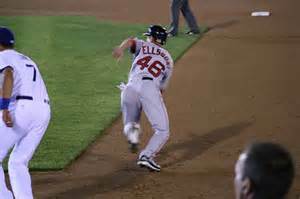 The Runner on 3rd can either score or be placed into a Run-Down Situation, which the trailing runner attempts to reach 3rd base safely…. The intent is to either manufacture a run, or set up a situation of scoring 2 runs instead of 1, plus staying out of a Double Play situation. All the Run-Down Drills can be used to improve offensive and defensive skills. In keeping with our intended goal, these drills require the maximum amount of players, maximum amount of skill training, offensive and defensive, and maximizes time management. These drills are advanced and complicated because the situations they address are complicated, but in order to advance your players’ skill levels and for maintaining maximum enthusiasm, they are excellent.